Now, let’s be clear. I DO NOT weigh more then him right now. But after that trip to Tucson, it is a little too close for my comfort. And I do not have the excuse of being pregnant, which is the ONLY time in our 17 years together that I have weighed more then him. But the pregnancy did end, the weight came off, and all was well in my world again. Until now. Although, just to be clear in case you missed the sentence above, I DO NOT weight more then him. DO NOT. But, unfortunately, I feel like I need to take some steps to ensure it stays that way. Since the daughter is on summer break I am only snacking on fruit, as I don’t want to share my treats with her her snacking on unhealthy food. And we swim in the pool almost daily. But my biggest change is that I’m trying to make really healthy dinners. It helps that it is insanely hot, so hot, heavy meals are undesirable. We are doing lots of light, fresh salads instead. Which is also great because they are easy to make ahead. Yesterday’s was a great one. 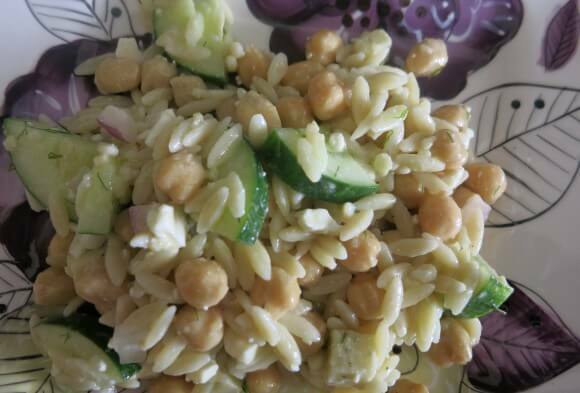 Orzo with garbanzo beans, cucumbers, dill, lemon and feta. I found the recipe at Two Peas and Their Pod. With the exception of the dill, all the ingredients are staples for me, so I didn’t actually make any changes to the recipe. Because even though dill is not a staple, it is a must. It is what makes the recipe. It gives the flavor, and is a nice contrast to the mellower flavors of the orzo and garbanzo beans. Plus it pairs beautifully with the feta. While I did not omit or change any ingredients, I did make two additions. The first was to serve the salad over spinach, in an attempt to make healthier and more filling. The second was to add some Havarti Dill cheese (along with the feta) that I had found at the awesome Italian grocery store I went to yesterday. Prepare orzo according to directions. Let cool, then combine with remaining salad ingredients. In small bowl, combine dressing ingredients. Pour over salad, and toss to combine. Can serve immediately, or let chill. Enjoy!